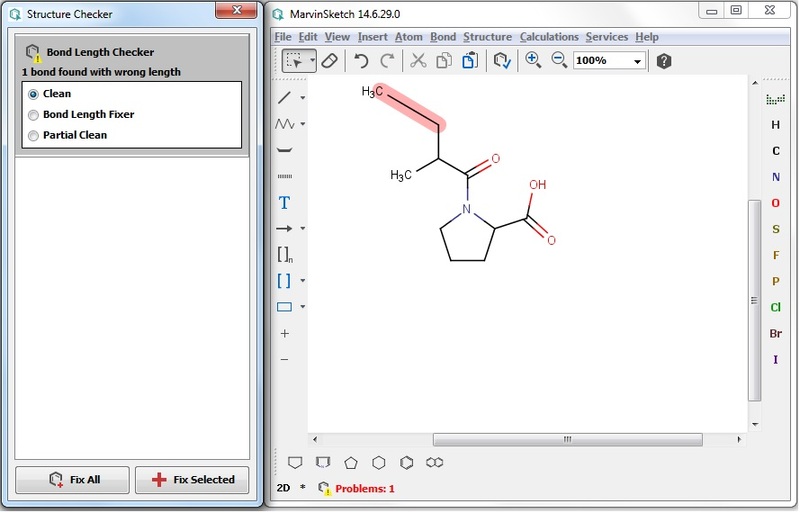 Structure Checker is integrated into Marvin Sketch and helps drawing chemically correct structures. Molecules are validated during the drawing process and detected structural issues are highlighted. Possible solutions are also offered that can be selected interactively by the user. Before you start using Structure Checker in MarvinSketch, consult the list of available checkers in the Preferences dialog (Edit >Preferences > Checkers tab). The default list contains checkers in alphabetical order. Feature detecting checkers: Feature checkers searches the selected molecule characteristics which in the specific structures are not considered as an error (e.g., query properties). Click on the name of the checker to see additional options and select the needed options by clicking the tick box. Some molecule properties might change after fixing an issue. You can define a checking sequence by moving up or down the list elements. The order of the checkers may be important in case you run a Fix All action. In order to change the sequence of the checker items, select the checker from the list and click on the up or down icon on the right side of the dialog window. To discard items from the checking sequence, select the checker and click on the button. For adding new elements to the list, click on the button and select the relevant checker. Different checking lists might be needed for different compound families. 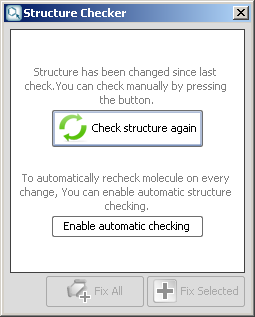 To make checking simpler, you can save your checking list to your computer and open it again if you are editing the same molecule type. Click the Save button to save your set checker configuration. Click the Load button to open a saved configuration list from file. You can also load remote checker configuration from URL . Unless you save this configuration to your computer, the loaded checker configuration cannot be modified. You can integrate custom, external checkers or fixers to the list of available checkers . You can see the path of currently applied configuration file at the bottom of the window. Custom checker and fixer implementations can be integrated into the list of available checkers. To learn about the details, visit Custom Checkers and Fixers. After you have finished adding external checkers and fixers, click on OK; the newly added checkers will appear among the factory checkers. 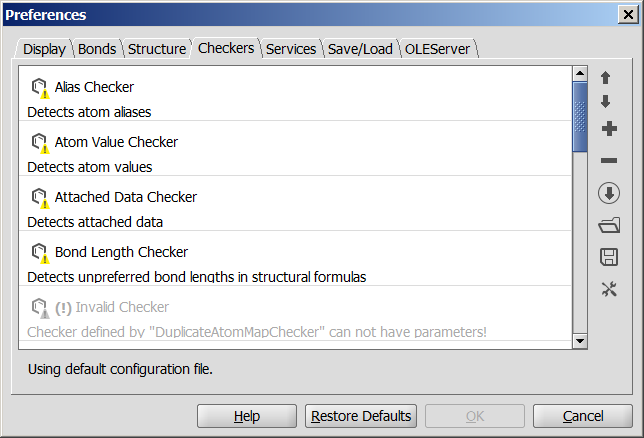 These external checkers/fixers will now also be available in Structure Checker Application and in all other applications using Structure Checker. When the external checker/fixer uses actionStringToken annotation, the checker can be referenced on the defined name in structurechecker command-line and in Chemical Terms applications as well. See how to Add checker(s) to checker configuration. Structure Checker configuration files may contain erroneous checker(s), i.e., Invalid Checker(s). If the imported configuration file contains invalid checker(s), a warning message will appear informing the user about the issue. Remove the invalid checker(s) from the list to accept the proper configuration. A Structure Checker window will appear next to the MarvinSketch window. The molecule regions found by Structure Checker are highlighted on the canvas with a light red color. If you click on any checker message, the affected area changes color to darker red. If you move the cursor over one of the affected region, the appropriate checker message is highlighted in the checker list. 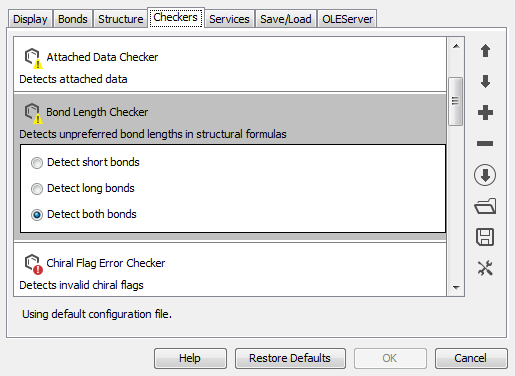 After you have changed the structure (including accepting a fix), the checker will offer re-checking: click on the Check structure againin the Structure Checker window. Another option is to turn on automatic re-checking: click the Enable automatic checking at the bottom of the text. At any point you can allow Structure Checker to fix the issues one by one or every of them by a single click. Turn on Automatic Check to follow every drawing step you make by a quick check. This option is switched on in the Structure menu or right-clicking the Checker icon on the status bar which then becomes colored. In case of an error, a red exclamation mark appears . Left-clicking on this icon opens the Structure Checker window, where all the warnings are listed. While the molecules are scanned for checker issues, a yellow question mark appears on the status bar. If the molecule is correct, a green check mark appears in the Checker icon on the status bar.